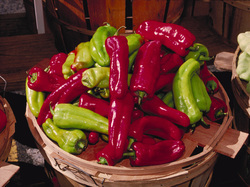 All are in the genus Capsicum and the sweet types are C. annum as are some of hot chillis. The genus contains other species such as C. baccatum, C. frutescens and C. pubescens. Where we know a listing to be other than C. annum we will list it. The "hot gene" in hot chillis tends to be dominant and chillis will cross with capsicums. Diggers have some excellent mixes of named varieties including some very hot chillis. New Gippsland Seeds also have a mix for sale. Diggers mixes Sweet Heirloom 7 Colour Mix Sweet Chocolate, Purple Beauty, White Cloud, Orange Bell, Yellow Marconi, Chinese Giant and Quadrati. Sweet Italian Heirloom Fryers Tolli's Sweet Italian, Italian Bull's Horn, Jimmy Nardello, and Marconi. Numex Big Jim, Black Mulato and Jalapeno. The common eggplants are Solanum melongena and the less common tomato fruited varieties are S. integrifolium. Eggplants in the Solanum melongena species will cross with one another and ones in the S. integrifolium species will cross with members of the same species but the two species shouldn't cross. Eggplants are self fertile and an isolation of 20m between varieties of the same species should be OK.
Ghost Good sized sweet elongated white skined variety. Diggers have a Heirloom mix that includes Rosa Bianca, Violetta de Firenze, Slim Jim and Turkish Orange. Turkish Orange is a Solanum integrifolium and shouldn't cross with other eggplants.